It fits great and the bright neon color makes me more visible to cars at night, so I feel more safe riding with it. I wear my helmet to commute on my bike to work almost every day. I also wear it when I am riding around town. The bright color helps me feel more safe, especially riding at night. My only critique is that the straps are a little funky to adjust, but generally it fits great. Also I love the adjustment nob on the back that helps the helmet fit my head. I was look for a simple helmet at a reasonable price. Very well built and fits well. It was everything I wanted to replace my old helmet that was starting to show its age. Great summerwarm weather helmet for an affordable cost. The helmet is light weight, does not obstruct vision, comfortable (I forget I'm wearing it at times) and a great breathable helmet for warmer seasons. Not the best for winter riding. For an inexpensive helmet it is a great value. I really like the high visibility and safety it provides. This helmet is used for both road and mountain biking. 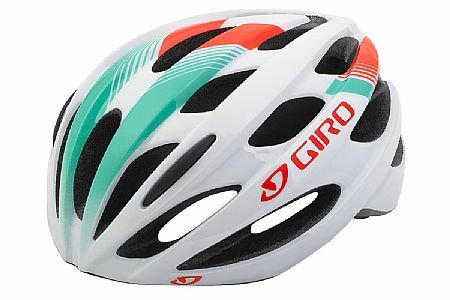 The helmet itself is made to the usual high standard of Giro products - the inner part and hard shell outer finish appear to be of high quality. The color is ideal, and gives maximum visibility, which I like very much. So far I've had no issues with the helmet venting system, and I've always felt comfortable when wearing it in hot weather. My problem has to do with the straps, which appear to be far too fiddly and hard to adjust, and I've yet to find a comfortable fit with this helmet (that might be to do with my horribly large head, the measurement of which is at the upper limit for the fitting range of this helmet). So far I have not found a way to keep both straps at the proper tension either the front ones are too loose and the rear ones too tight, or vice-versa, and after much fussing and fiddling, I am still no nearer to finding a way to keep both sets of straps adjusted for optimal comfort and safety. Unless I do finally get the strap tension right, I am not sure if I want to continue wearing this helmet, and I can see myself replacing it with something different in the very near future. Great Helmet for everyday use! Great Helmet with easy adjustments! Good fit, cool and light. I use this on the road, it can be adjusted for skull cap wearing in the winter and head sweats in the summer, highly visible color. A bit bulky, but decent helmet for price. I have a Trinity and a Foray. I prefer the Foray size and look, but for the price it is a decent no frills helmet. I purchased this helmet in white and silver to complement my shoes and as a neutral colour (have two others black and green) that can be worn with a host of my jerseys. The helmet appeared extremely small (one size) and this was a concern initially. However, it fits perfectly and can be adjusted easily for a custom fit and the ventilation was adequate. It is light weight and during my ride I did not think about it once as it stayed in place and made me forget about it being on thereby allowing me to enjoy my ride as usual. hi-viz green color for fallwinter and I feel it really increases my visibility. Overall I'd buy this helmet again and definitely recommend this helmet to other riders. I picked the white with silver/gray accents because it goes with a lot of things - almost any color of clothing. It is my lightest helmet. Size medium fits as expected, which isn't true of all helmets. The only improvement I would make is a visor, but those seem to be found only on mountain bike helmets. Good for daily commute! Bright and nice looking helmet with enough ventilation. Recommend!